The RCA Victor album Piano Music of Mendelssohn and Liszt, by Vladimir Horowitz, is one of the six new additions to the brand new second edition of Paul Maréchal’s catalogue raisonné of Andy Warhol record covers. Maréchal situates the date of release about 1954, and to be even more precise the album was released in the second half of 1953. The record is mentioned in The Billboard of December 5 1953, page 35 in the section Classical Recent Release Sellers. It is stated that “All records listed have been released less than six months ago”. The blotted line drawing of two hands and piano keys resembles one of the (many) drawings Warhol did earlier for the RCA jazz album cover Progressive Piano, but which was most likely never released. One can guess that because one project had been aborted, Warhol has reused the same idea for another. 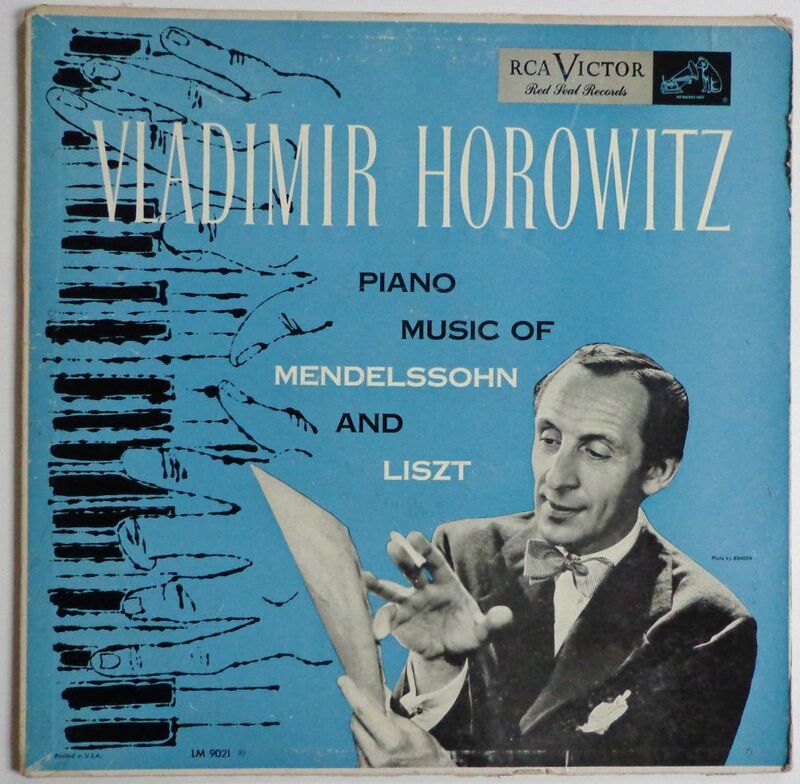 Two versions of the Horowitz cover with the Warhol drawing exist: the US stiff cardboard cover, and a German release in a laminated & much thinner cover. After three years already the album was reissued with a generic cover in the RCA-series Vault Treasures, which was basically created for the mail order market. US release with cardboard cover. German release on thin, glossy cover. Left German release, right US release. Back covers: Left German release, right US release. Re-issue from 1956 in generic Vault Treasures cover, for the mail order market. At the online auction Andy Warhol @ Christie’s: Entertainers in 2013 an ink drawing called Two hands was for sale. It is the exact mirror image of the blotted line drawing for one of the trial versions from the Progressive Piano series. This most likely was Warhol’s original drawing on which he placed the transparent paper, to trace and afterwards blot the drawing. Progressive Piano, print from the collection of The Andy Warhol Museum, Pittsburgh. Original ink drawing from Warhol’s estate sold at Christie’s. It is the mirror image of the drawing on the Progressive Piano cover proof (above). The drawing also very much resembles Warhol’s cover drawing for the Horowitz LP cover.